Global sea level rise is accelerating incrementally over time rather than increasing at a steady rate, as previously thought, according to a new study based on 25 years of NASA and European satellite data. Credit: NASA's Goddard Space Flight Center/Kathryn Mersmann. Download more visualizations at NASA's Scientific Visualization Studio. If the rate of ocean rise continues to change at this pace, sea level will rise 26 inches (65 centimeters) by 2100 — enough to cause significant problems for coastal cities, according to the new assessment by Nerem and colleagues from NASA's Goddard Space Flight Center in Greenbelt, Maryland; CU Boulder; the University of South Florida in Tampa; and Old Dominion University in Norfolk, Virginia. The team, driven to understand and better predict Earth's response to a warming world, published their work Feb. 12 in the journal Proceedings of the National Academy of Sciences. Rising concentrations of greenhouse gases in Earth's atmosphere increase the temperature of air and water, which causes sea level to rise in two ways. First, warmer water expands, and this "thermal expansion" of the ocean has contributed about half of the 2.8 inches (7 centimeters) of global mean sea level rise we've seen over the last 25 years, Nerem said. Second, melting land ice flows into the ocean, also increasing sea level across the globe. These increases were measured using satellite altimeter measurements since 1992, including the Topex/Poseidon, Jason-1, Jason-2 and Jason-3 satellite missions, which have been jointly managed by multiple agencies, including NASA, Centre national d'etudes spatiales (CNES), European Organisation for the Exploitation of Meteorological Satellites (EUMETSAT), and the National Oceanic and Atmospheric Administration (NOAA). NASA's Jet Propulsion Laboratory in Pasadena, California, manages the U.S. portion of these missions for NASA's Science Mission Directorate. The rate of sea level rise in the satellite era has risen from about 0.1 inch (2.5 millimeters) per year in the 1990s to about 0.13 inches (3.4 millimeters) per year today. "The Topex/Poseidon/Jason altimetry missions have been essentially providing the equivalent of a global network of nearly half a million accurate tide gauges, providing sea surface height information every 10 days for over 25 years," said Brian Beckley, of NASA Goddard, second author on the new paper and lead of a team that processes altimetry observations into a global sea level data record. "As this climate data record approaches three decades, the fingerprints of Greenland and Antarctic land-based ice loss are now being revealed in the global and regional mean sea level estimates." Even with a 25-year data record, detecting acceleration is challenging. Episodes like volcanic eruptions can create variability: the eruption of Mount Pinatubo in 1991 decreased global mean sea level just before the Topex/Poseidon satellite launch, for example. 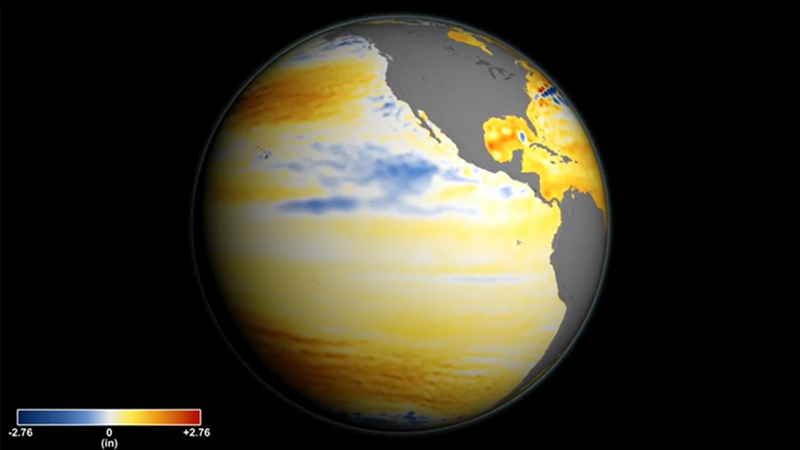 In addition, global sea level can fluctuate due to climate patterns such as El Ninos and La Ninos (the opposing phases of the El Nino-Southern Oscillation), which influence ocean temperature and global precipitation patterns. Nerem and his team used climate models to account for the volcanic effects and other datasets to determine the El Nino/La Nina effects, ultimately uncovering the underlying rate and acceleration of sea level rise over the last quarter century. The team also used tide gauge data to assess potential errors in the altimeter estimate. "The tide gauge measurements are essential for determining the uncertainty in the global mean sea level acceleration estimate," said co-author Gary Mitchum, University of South Florida College of Marine Science. "They provide the only assessments of the satellite instruments from the ground." Others have used tide gauge data to measure sea level acceleration, but scientists have struggled to pull out other important details from tide-gauge data, such as changes in the last couple of decades due to more active ice sheet melt. In addition to NASA's involvement in missions that make direct sea level observations from space, the agency's Earth science work includes a wide-ranging portfolio of missions, field campaigns and research that contribute to improved understanding of how global sea level is changing. Airborne campaigns such as Operation IceBridge and JPL's Oceans Melting Greenland gather measurements of ice sheets and glaciers, while computer modeling research improves our understanding of how Antarctica and Greenland will respond in a warming climate. In 2018, NASA will launch two new satellite missions that will be critical to improving future sea level projections: the Gravity Recovery and Climate Experiment Follow-On (GRACE-FO) mission, a partnership with GeoForschungsZentrum (GFZ) in Germany, will continue measurements of the mass of the Greenland and Antarctic ice sheets; while the Ice, Cloud, and land Elevation Satellite-2 (ICESat-2) will make highly accurate observations of the elevation of ice sheets and glaciers.